"Get that worried look off your face and they'll never know you're a married man." Silent comedy immediately brings to mind slapstick and frantic chase sequences. While that wasn't everything in silent comedy, it certainly was a substantial part of it. 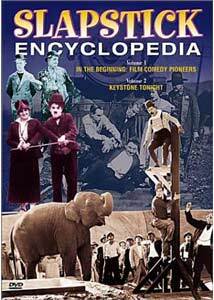 This massive, five-disc set contains 56 of the finest one- and two-reel comedies from the well known and the unknown. Each film is preceded by two screens of production notes containing a bit of history. The leading lights in the silent film accompaniment world also lend their talents to this set. Among them are Robert Israel (both with an orchestra and playing a 'Fotoplayer,' a tinny piano with various sound effects), Phil Carli, Eric Beheim, Brian Benison, Ken Rosen and the Mont Alto Orchestra, among others. Even the synthesized scores sound convincing here, indicating substantial progress in this technique. Generally they fit the subjects quite well and add a lot to the enjoyment of the pictures. Relying heavily on Zez Confrey's novelty pieces and Scott Joplin's ragtime, they're generally period-appropriate as well. Produced by David Shepard and Film Preservation Associates, this set contains ten programs of nearly two hours each. The following links will take you to full discussions of the contents of each disc, since there's far too much to talk about in a single review. Image Transfer Review: The films, being the age they are and public domain pictures to boot, are not in pristine condition. But we can't really expect that. What is astonishing is how good most of them look. There are speckles and flickering, but in general there are good black levels and decent detail. Most of them are recycled laserdisc transfers, so there is a bit of softness that might not be in the originals, but they're certainly quite tolerable, even on a large screen. Most are presented in plain black & white. Circus Today, The Detectress, Get Out and Get Under and Family Life are toned sepia. Fatty and Mabel Adrift and The Garage are given color toning. The Boat is unfortunately in the worst condition, with substantial nitrate decomposition affecting some of the funniest sequences. However, these are fleeting and most of the pictures look terrific. Audio Transfer Review: The musical tracks mostly sound excellent. Ken Rosen's Wurlitzer has deep, echoing bass, and other tracks sound crisp and clean. The exception is Circus Today, which is hissy and noisy, apparently taken from an old source and not provided with a new score. Rowdy Ann also has a mild electric buzzing sound in the background, but it's not noticeable at low levels. Extras Review: There aren't any extras per se other than the production notes for each film. However, there are three shorts that were not included in the VHS or laserdisc incarnation of this set (in addition to Oh, Doctor), and are denoted here as Bonus Shorts, so we'll count them as such. Besides, the main review was too long anyway. Program Three contains two additional Harry Langdon short subjects, both dating from 1925. His Marriage Wow is first-rate, with Harry starting off waiting for his wedding in the wrong church. His timing and expression as he tries to get the money back from the reverend is priceless. Vernon Dent here is Professor McGlumm, a pessimist who manages to convince Harry that his intended, Agnes (Natalie Kington) is, like her sister, a black widow bent on murdering him for the insurance. A wide variety of tactics to avoid the marriage fail, and McGloom (as well as the rest of Agnes' relations) move in. The short concludes with a wild car ride through the streets of old Los Angeles, sans steering wheel. The other bonus Langdon short is All Night Long, which is basically a World War I story wrapped with a framing device. Harry is in France, peeling a mountain of potatoes, when called upon by Sgt. Gale Wyndham (Dent again) to accompany him as he visits his girl, Nanette. However, she falls for Harry and the sergeant spends the rest of the short trying to put Harry into harm's way and eliminate him. The framing story is elaborate to the point of seeming to be pure padding. However, it does end up with a truly surprising sight gag that evoked a hearty chuckle from me. The final bonus short is Harold Lloyd's Haunted Spooks. This time out, Mildred Davis has inherited a Southern mansion on condition that she and her husband live in it for a year. Her uncle (Wallace Howe) schemes to prevent this, however, by making them and the servants think the house is haunted. Actually, this aspect is almost throwaway, getting only a couple minutes of play at the end. More important is the classic sequence where Harold attempts to kill himself in a variety of ways, failing miserably each time, until he learns that Mildred wants to marry him. The short is plagued with racial stereotyping and humor, but putting that aside it's a very good picture.